Bombardier received his first patent for a tracked vehicle made for travel over snow in 1937. This was the “B7”, a multi-passenger vehicle built at the l’Auto-Neige Bombardie Limitée factory in Valcourt, Quebec. Though these large snow machines were the mainstay of his company, Bombardier’s dream was to eventually produce a smaller, lighter version that he hoped would replace the dog team as the principle means of winter transport in rural Canada. In 1959 the Ski-Dog snowmobile, the first mass-produced lightweight snow machine, went on sale. After years of development and testing these machines, based on a totally new design, were an instant success. A typographical error in the brochure printed for the promotion of these snowmobiles turned the Ski-Dog into the Ski-Doo and the name stuck. 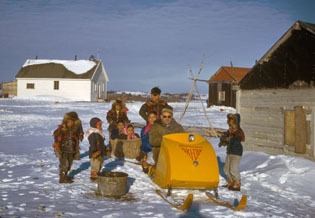 The introduction of the Bombardier Ski-Doo, along with other brands of snowmobiles, revolutionized winter travel in the north. In many isolated northern communities snowmobiles did replace dog teams and are now more common than cars or trucks. They serve a wide range of purposes from hunting to grocery shopping.